Along with common sacrifices and activities, you are now able to sacrifice experience to our gods. 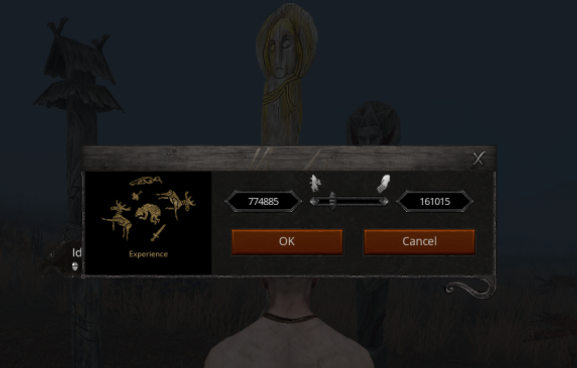 Sacrificing XP has the same impact on your position in the rankings as all the other actions for a given god combined. Every day at 21:00 UTC, players who made it in Top-100 will receive a blessing from their current god that speeds up XP to skill point conversion for the skills governed by the said god. This bonus will be active for 24 hours. Note: In order to receive the skill raise bonus, players in the top of the god's ranking need to be online between 21:00 - 21:30 UTC. This bonus will be automatically applied after the election is finished, and it is going to last until the end of the next elections. Please note that the bonus will be eligible only for the skills that are patronized by a certain god. To use this bonus, you will have to set certain skills to be raised. This amount will be taken away from your XP pool and will be converted to your rating score for this god. From now on you can spend certain amounts of precious metals to increase the size of your fief by 1 tile in all directions. If you upgrade two neighboring fiefs in this manner, it will effectively remove the neutral tiles line between them and will allow you to build the bigger towns and castles without being afraid that certain parts will decay! 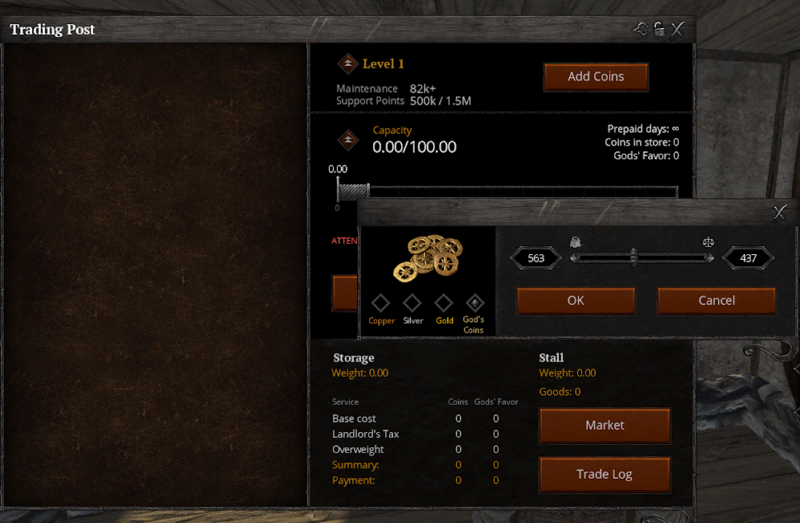 If an increased fief has a change of ownership, it’s default size will be restored to the original fief size. It’s impossible to increase a fief more than once. The maintenance cost will increase due to the addition of tiles. 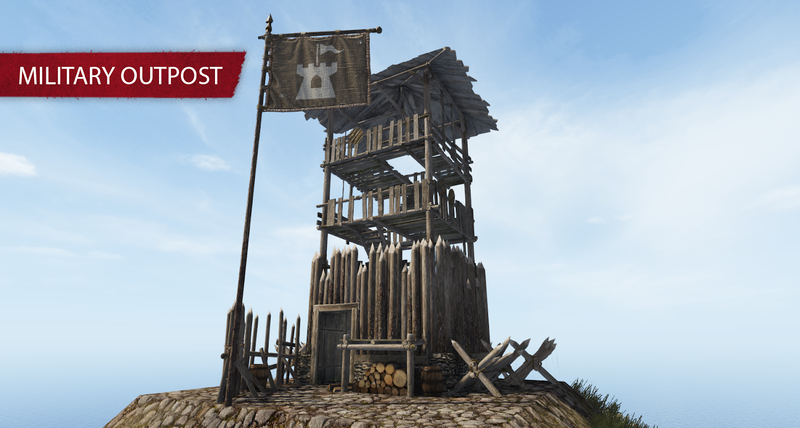 This is the only type of outpost that can be constructed on any distant non-connected fief. It’s slightly cheaper to construct and upgrade, though it still requires a certain amount of effort. This outpost does not produce anything. Consider it to be the main guild vs guild offensive outpost. Overseer and slaves will act as archers and will attack any player that does not have ‘Can enter’ access set on the fief anytime. You can’t build more military outposts than your guild monument level (e.g. if your Guild Monument is level 3, you can build 3 Military Outposts max). You can now use God’s Coins to pay for your monument and outposts. 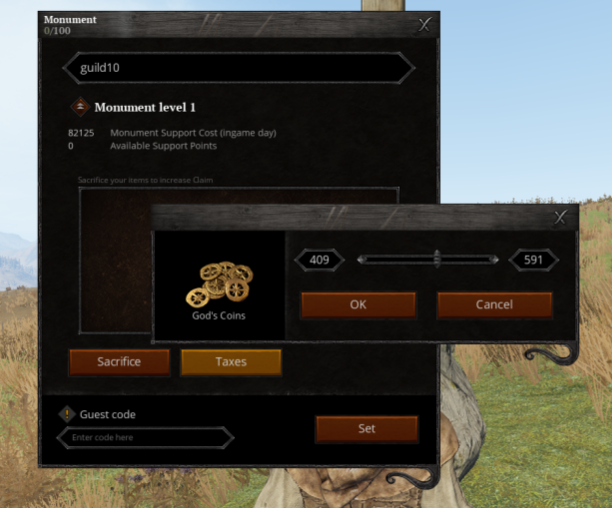 Also, you are now able to open an interface on your Guild Monument that will show the list of all your guild outposts. This interface will allow you to pay for their support remotely. 1 God’s Coin = 1000 Support points. 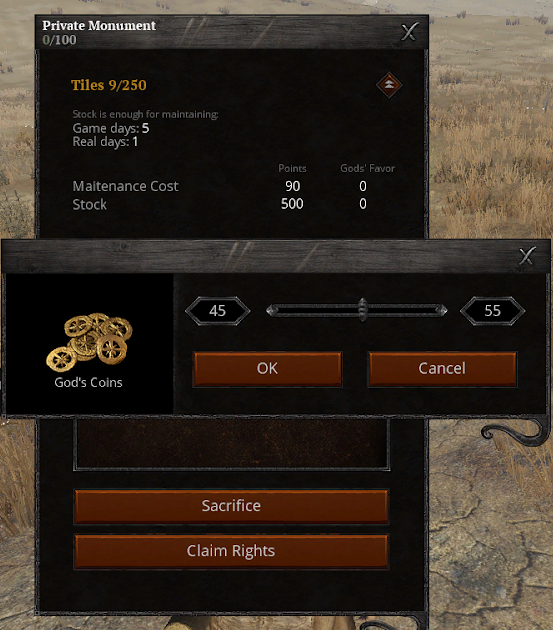 Simply drag and drop the required amount of God’s Coins in your Guild Monument container and click ‘Sacrifice’. The number of support points equal to the sacrificed God’s Coins will be added to your monument. Click ‘Add coins’ and choose God’s Coins radio button. Then simply choose the required amount of God’s Coins and click ‘Ok’. 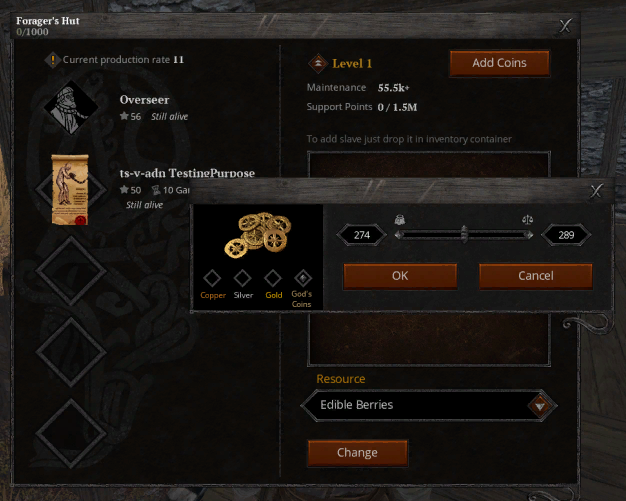 Simply drag and drop the required amount of God’s Coins in your Personal Monument container and click ‘Sacrifice’. 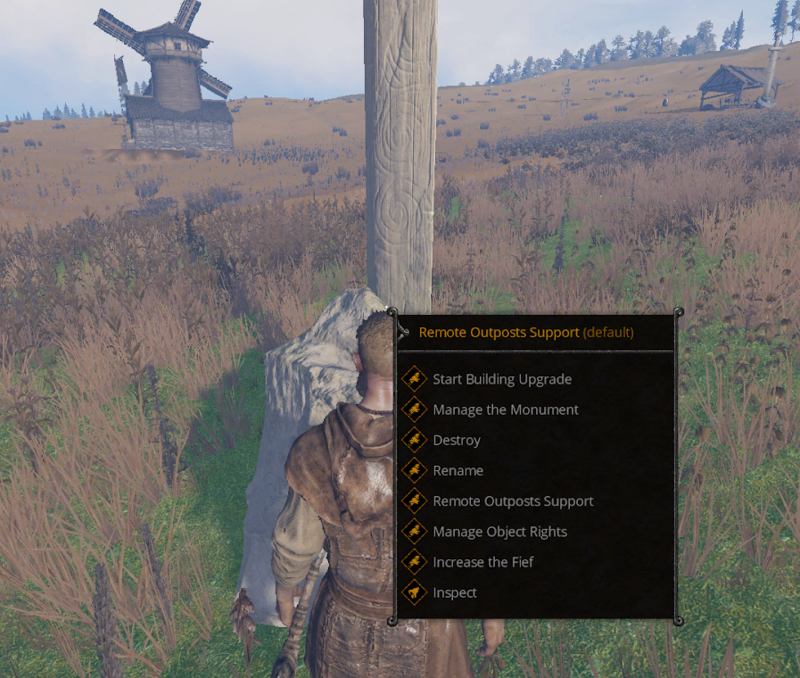 The number of support points equal to the sacrificed God’s Coins will be added to your monument. ‘Remote Outpost Support’ ability can be used by any guild member who has ‘Can Use’ right by clicking RMB on Guild Monument. You should notice that the remote outpost support can be paid in God’s Coins only. 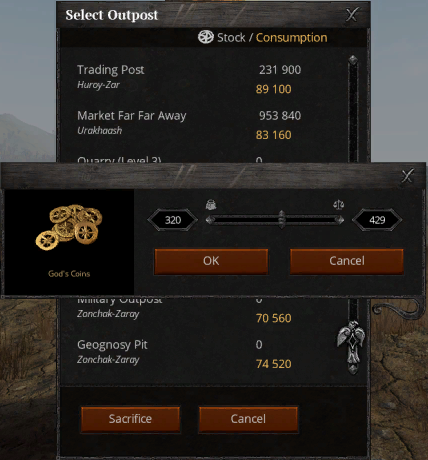 To support any of your controlled outposts remotely just click on any outpost from the list and choose the number of God’s Coins to sacrifice. Note: you need to have a sufficient amount of God’s Coins in your character inventory. We’ve promised that settlers of Godenland would have the Pioneer amulet for a month. These amulets will remain with their owners as memorabilia, however, the special effect of this amulet that allowed you to perform all abilities 20% faster will no longer be active when the month ends. We’ve implemented a booster that can be bought in the Premium store that will temporarily provide the player with the same effect — the “Inspired Boosters”. You can find them in Premium Shop -> Boosters & Insurances section. Note: Only 1 booster of this type can be active at a time, however, you can activate boosters of other types while this one is active (for example, you can simultaneously use Inspired Booster and Crafting Experience Gain booster). You will not be stuck in the bug/death pits, or high in the mountain pockets. 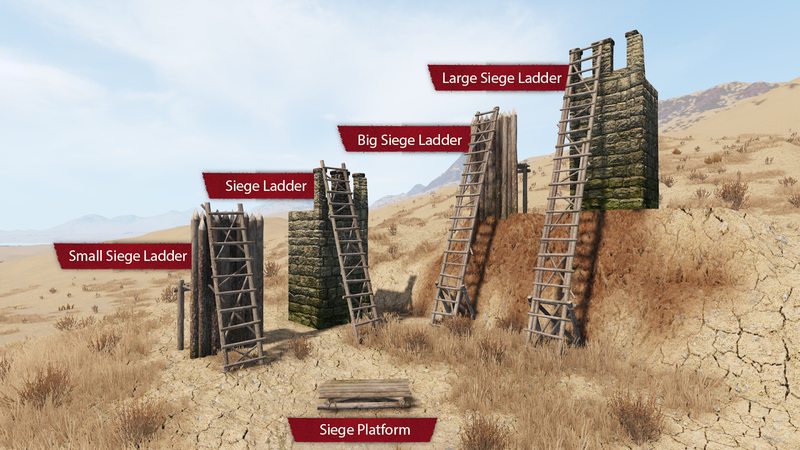 If you approach terrain or objects that are too steep to traverse normally for your character, your character will start climbing automatically. You need to make sure that you’re in a peaceful stance and facing the slope with your character. Works for surfaces that are angled between 45 and 75 degrees. Anything vertical or close to being vertical cannot be climbed. Note: You will still be able to use the ‘/stuck’ command in system chat for tricky situations.